^ Raul Hilberg. The Destruction of the European Jews. 1973: 677. ^ 2.0 2.1 2.2 Hamilton 1984, p. 160. ^ 3.0 3.1 3.2 Hoffmann 2000, p. 50. ^ 6.0 6.1 McNab 2009, pp. 10, 11. ^ Hamilton 1984, pp. 160, 161, 172. ^ Hamilton 1984, p. 172. ^ 13.0 13.1 13.2 13.3 13.4 Hamilton 1984, p. 161. ^ Hamilton 1984, pp. 160–161. ^ Hoffmann 2000, pp. 50, 51. Biondi, Robert (编). SS Officers List: (as of 30 January 1942): SS-Standartenfuhrer to SS-Oberstgruppenfuhrer: Assignments and Decorations of the Senior SS Officer Corps. Atglen, PA: Schiffer. 2000 . ISBN 978-0-7643-1061-4. Hamilton, Charles. Leaders & Personalities of the Third Reich, Vol. 1. R. James Bender Publishing. 1984. ISBN 0-912138-27-0. Hoffmann, Peter. 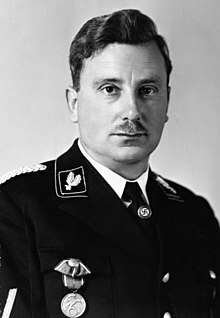 Hitler's Personal Security: Protecting the Führer 1921–1945. Da Capo Press. 2000. ISBN 978-0-30680-947-7. McNab, Chris. The SS: 1923–1945. Amber Books Ltd. 2009. ISBN 978-1-906626-49-5. Wegner, Bernd. The Waffen-SS: Organization, Ideology and Function. Blackwell. 1990. ISBN 0-631-14073-5.